BHP Billiton Ltd. is boosting sales of the top-quality nickel that’s needed for electric vehicle batteries, another sign the world’s biggest miner is targeting more opportunities in the booming sector. Sales of refined nickel, a category that includes the premium products used for battery production, jumped 18 percent in the three months to Sept. 30 from a year earlier, according to a statement Wednesday. The company has begun offering more detailed data on nickel and cobalt production amid investor interest in its exposure to the rise of EVs. BHP’s Nickel West operation in Western Australia is aiming to sell 90 percent of output to the battery sector by the end of next year, switching away from a traditional customer base in the stainless steel market. Laboratory tests are also developing methods to produce cobalt sulphate, another key material for rechargeable batteries. The nickel sector is becoming a two-tiered market, with a weaker outlook for materials bound for the stainless steel industry and robust demand growth in the EV sector that’ll support prices, Goldman Sachs Group Inc. said in a note received Tuesday. In a note of caution, Russia’s nickel mining giant MMC Norilsk Nickel PJSC sees EV-related demand slowing in 2019 as some countries cut subsidies to the vehicles. 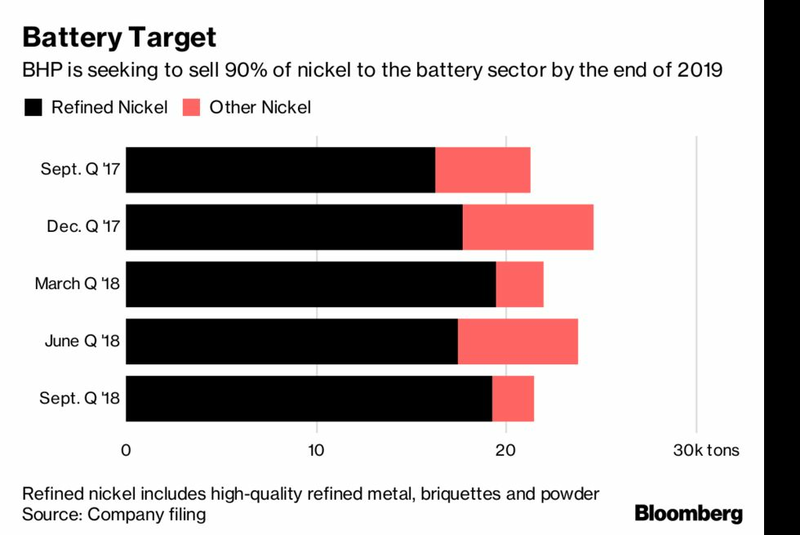 “The market hasn’t made its mind up about how big a deal batteries will be for nickel, but there are a lot of bullish forecasts out there, so it is an area of interest for sure,” Mathew Hodge, an analyst at Morningstar Inc. in Sydney, said by phone.